Just like 2017 is the year of the rooster in the Chinese calendar, 2017 also has a designated bulb, perennial, annual and edible. While a national designation, these "2017 Year of" plants offer noteworthy advantages for Colorado gardeners. Read on to learn which plant was once considered a weed and which one won't be eaten by mice, voles, squirrels, rabbits or deer. All of the 2017 designees could be good for your landscape - even if your garden plot is as small as a container on your patio. Did you know our country has always enjoyed daffodils because women sailing to the new world sewed the bulbs into the hems of their skirts because they had nowhere else to put them on the ships? And if you guessed they are the plant distasteful to many animals, you earn a gold star. These early bloomers of spring are in our heritage and a great fit for gardens nibbled by wildlife. Daffodils are well suited to Colorado's climate and require little maintenance. Say what? The word "brassica" denotes the family of hardy, early and late season edible crops that are so healthy for us. Think broccoli, Brussels Sprouts, bok choy, cabbage, cauliflower, kale, rutabaga and turnips. These crops have been a major food source throughout history and are grown around the world. Brassica are among foods highest in Vitamin C, antioxidants and other compounds that reduce risk of cancer. Simply buy a packet of seeds, follow the instructions on the package and you're off and running to enjoy healthy, home-grown veggies. The US National Flower is perennial of the year. Long before arriving in America, the rose was recorded in China some 7,000 years ago. Fortunately, today's varieties are easy-to-grow staples in the landscape. Plant them where they will have 6 to 8 hours of full sun and irrigate them with water-conserving drip irrigation. Drip avoids common diseases brought on by wet foliage watered by spray irrigation. Roses require some pruning to produce many blooms, but the process is user friendly as long as you know when to prune and avoid the thorns. Ground cover roses require no pruning at all. The plant considered a weed until early in the 19th century is the pansy. Now varieties are grown worldwide and enjoyed for their range of colors from near-black to bright yellow and many soft shades between. 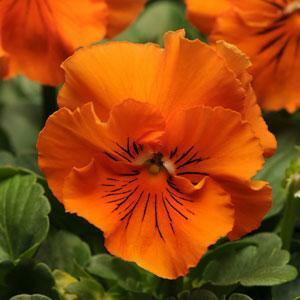 They are suitable for any sunny space and can be planted in the ground, in containers and hanging baskets. Pansies are edibles, so plant them with early lettuce and use their blooms to dress up salads. Blooms can also be candied to decorate cakes.